Illustrating Choices at a Pollinators Buffet: High-speed Photography of the Night-flying Moth Manduca sexta. The night-flying moth, Manduca sexta, must choose from among a variety of possible nectar sources as they wing through the environs in which they live. These important pollinators of many night blooming flowers may shift between food sources based on their abundance and the innate odor preferences of the insect. How the moth’s brain and antennae recognize these floral odors is not well understood and is one of many subjects of study in the department of Neuroscience at the University of Arizona in Tucson. 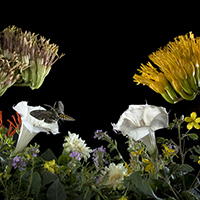 To illustrate the concept of behavioral flexibility and floral preference in Manduca for a possible journal cover, high-speed photographs were made of free flying male moths in the laboratory. Figure 1. Adult male Manduca sexta, shown with a 5th instar larva. The larvae of Manduca feed on a variety of plants in the nightshade family, Solanaceae, and may often be found “interacting” with tomato and pepper plants in home gardens. Figure 2. Sacred Datura, Datura wrightii. The white trumpet shaped flowers of Datura may be 20cm deep. Flowers bloom at dusk as night flying pollinators are beginning to fly. Figure 3. High-speed flash unit built by the late Ken Olson. This compact unit fires up to four flash heads at speeds of either 1/33,000 or 1/20,000 of a second. 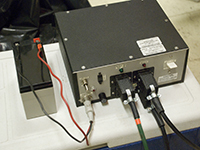 The gray 12 volt battery, on the left, allows the unit to operate in the field. Figure 4. A variety of native flowers were arranged on a low platform inside the flight cage. Green florist foam, soaked in water and covered in black fabric, held the flowers. Two strobe heads were positioned to rim light the subject. Cardboard scrims help keep stray light off of the background. Figure 5. Final, image, cropped and converted to TIFF, levels adjusted and image retouched in Adobe Photoshop CS3. The sphinx moth Manduca sexta is a large animal with a wing span as large as 14 cm. The moth is also known by its common name, the Tobacco Hornworm (Figure 1). Though M. sexta are attracted to many plants in the nightshade family, in the semi-arid environment of the southwest USA their favorite native host plant is the Sacred Datura, Datura wrightii. 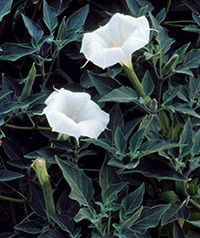 Datura, sometimes called jimson weed, is a low, dark green shrub whose white trumpet-shaped flowers bloom at dusk, just when the moths are beginning to fly (Figure 2). The flowers of Datura provide a rich nectar source for adult moths. While drinking the nectar of the Datura flowers the moths serve as effective pollinators for the plant thereby forming a mutualism where both organisms benefit. Moths, like butterflies, have a very long proboscis that is normally held coiled up close to its face. When feeding, the proboscis is unrolled, and like a long soda straw, is used to sip nectar from the flower. The Datura flowers are so deep that the moths will often climb into the flower to get at the nectar, ensuring pollination in the process. The moths are fast flyers (6 miles per hour) and beat their wings at frequencies of 10-20 times per second. To freeze the moths in flight, a high-speed flash unit was used. This unit, built by the late Ken Olson, has two flash speeds; 1/20,000 of a second at full power and 1/33,000 of a second at half power. The flash runs off a 12 volt battery so it can be used in the field (Figure 3). The author would be remiss not to make mention of Dr. Harold E. Edgerton’s pioneering work in the development of the Electronic flash and his own efforts with high speed flash photography (http://en.wikipedia.org/wiki/Harold_Eugene_Edgerton). A variety of native flowers, that represent some of the possible nectar sources moths might encounter in the southwest USA, were set up inside a screened flight cage measuring approximately 6 x 6 x 6 feet. A small platform was placed in the center of the enclosure. On the platform was set green florist foam, soaked in water and covered with black cloth. Holes were cut in the cloth and the flower stems were poked into the foam to help keep them fresh during the several hours of studio time. Ring stands held the two species of Agave flowers on each side of the arrangement and wet foam was placed on the ends of their stems to help keep them fresh as well (Figure 4). Two strobe heads were placed behind the flower arrangement to provide rim lighting of the subjects. Mat board scrims were used to prevent stray light from falling on the background. A third flash head, with a diffuser, was positioned above the camera. A Nikon D80 digital SLR, with a Wein adapter to allow the flash to be fired by the D80’s hot shoe flash mount, was used to capture the images. All of the equipment, with the exception of the camera, was setup inside the flight cage. The door of the cage was zipped as close as possible to the camera lens to help prevent animals from escaping. Prior to photography, and the release of moths into the flight cage, the room lights were turned off and red lights turned on. The red lights allowed us to work easily, because moth vision is deficient in the red part of the spectrum. Under the red lights, a small cage of newly emerged male moths was slipped under the screen on the right side of the enclosure. As the moths emerged and flew about, the photographer would simply watch from over the top of the camera firing it manually, when moths appeared to be in an appropriate spot. The technique was a little hit-and-miss, certainly not as accurate as looking through the viewfinder, but much more comfortable for the photographer given the extended studio session. Photographs were made with the camera pre-focused in the center of the flower arrangement. The flash unit was set for full power. The ISO of the Nikon D80 was set at 100, white balance on automatic, and the 18mm to 135mm zoom lens aperture was set for f/22. The resulting effective exposure was 1/20,000 of a second at f/22. This combination of short, powerful flash durations and small aperture gave us the ability to freeze the wings of the powerful flyers, and yielded the maximum depth of field possible with that lens. Periodically photography would cease, the enclosure unzipped, and the camera lens blown off with canned air to remove wing scales sloughed off (in alarming numbers) from the wings of the flying moths. Even though this step was taken every few exposures, the moth scales were so numerous, and resolutely attracted to the front lens element, that all images showed evidence of scales and required a good deal of retouching. A large number of exposures were made over a period of about two hours. The resulting RAW image files were approximately 8,259KB in size including the 8,252 KB Nikon NEF file and its accompanying 7 KB XMP file. Files were opened in Adobe BridgeTM then edited in Photoshop CS3TM (Figure 5). Creating a cover photo for consideration by a scientific journal requires careful planning. The photographer must understanding the layout of the journal cover as well as the journal’s use of type for titles, etc. on the cover. Planning for this series of images initially began with a brief hallway meeting that consisted of much gesturing with our hands (to help us get a mental picture of the set-up and the moths flying to the flowers) and verbal brainstorming. Testing, further discussion and more gesturing ensued. Careful selection and arrangement of freshly gathered flowers was key to having an exciting, yet realistic portrayal of behavioral flexibility and floral preference of the moths, which captured in a single frame the concept of the journal article. Newly emerged male moths, though naive, were quite handsome on the wing and proved to be willing and capable nectar seekers. The end result is a final set of very satisfying images. Time will tell if indeed one of our images is selected by the journal for its cover. Dalton, Stephen 1982. Caught in Motion: High-Speed Nature Photography. Van Nostrand Reinhold. ISBN 0442219512. Dalton, Stephen 1975. Borne on the Wind: The Extraordinary World of Insects in Flight. Chatto and Windus. ISBN 0701121300. Edgerton, Harold E., and Killian, James R. 1939. Flash! : Seeing the Unseen By Ultra High-speed Photography. ASIN B00085INJ. Edgerton, Harold E. 1987. Electronic flash, strobe (3rd ed.). Cambridge, MA: MIT Press,. ISBN 0-262-55014-8. The oral presentation of the material in this article was the recipient of the Best Paper Award at BIOCOMM 2009, held this past summer in Park City, Utah. I would like to thank Drs. John Hildebrand and Jeff Riffell for their help with this project. Margeret Marez and Alice Stone provided helpful guidance rearing the moths. This work was supported by National Institute of Health grant DC-02751 (to J. Hildebrand). Charles Hedgcock is a Research Specialist Senior in the Department of Neuroscience at The University of Arizona, Tucson, USA. He is a Registered Biological Photographer (RBP) and a Fellow of the BioCommunications Association (FBCA).